See the sights on both the French and Dutch sides of the St Maarten during this 5-hour tour led by a local guide. After a historical overview of Philipsburg, enjoy beautiful views of the island and its shorelines at several lookout points, including Simpson Bay and Cole Bay Hill. Head to the legendary Maho Beach and Orient Beach. Feed the iguanas in Coralita Bay, a nature reserve overlooking St Barths. 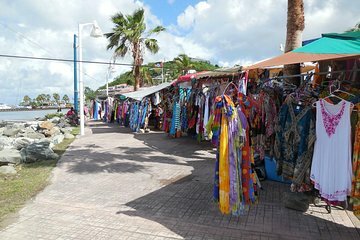 Spend some time walking and shopping in the town of Marigot, and explore the restaurant-lined streets of Grand Case. Refreshments and round-trip transportation from St Maarten hotels are included. Very nice! Air conditioned van and tour guide was very informative. Saw a lot of things and learned a lot of history. Interesting trip to visit both French and Dutch side. Even get to visit Maho Beach to see the famous low landing planes. Great guide, excellent talk while on the bus and a great experience. Went to a few different places because of Hurricane recovery - but they were probably better. Maho beach is a bit of a zoo - but nothing to do with tour: just a real busy tourist spot. We had a great tour of the island even though it was a non cruise ship day so many things were closed. Wellington did a great job taking us to both sides of the island. He was informative, and made sure we stopped at teh good places to eat. This is a complete rip off. I booked the tour for two people and the morning off, I received an email saying that the tour isn't available on that day. Not an issue. The issue is that on Monday, 12 June 17, a week later, my account was charged for the two person tour. I replied to the email address that informed me of the tour not being available and I received an automated reply. DO NOT BOOK. It was good. The driver could have been more informative about the island. We had a great bus driver who made the trip very interesting. Was disappointed that we got dropped off here and there where there were tons of the same kind of souvenir shopping. Maho Beach wasn't that big of a deal. Yes, the airplanes flying over so close to the beach was truly something to see but the beach was crowded, rocky and not that clean looking.